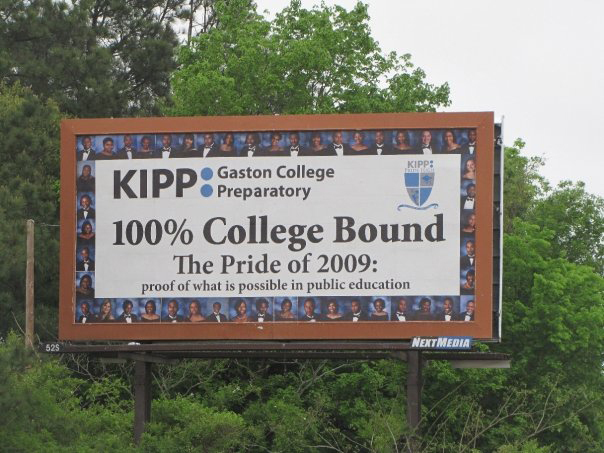 Six years after KIPP Gaston College Prep graduated its first class in the one-stoplight town of Gaston, North Carolina, 61% had earned college degrees. Now census data show that the percentage of area residents holding bachelor’s degrees has doubled over the past five years. On the short drive from Interstate 95 into Gaston, North Carolina, a one-stoplight home to a little over 1,000 folks, you can see a paper mill smokestack belching on the horizon. “Smells like money” — that’s what they say in every paper mill town. You don’t see any of the nearby prisons, but working as a corrections officer is a common job here. Plus peanut farming. Or soybeans. This is rural North Carolina. Not like trendy, upscale Smoky Mountains kind of rural, where the hillsides just below the national park get dotted at night with the dusk-to-dawn lights of million-dollar-plus homes. This is the poor, flatland kind of rural poverty, nearly invisible off I-95. The kind of rural where, despite the young people here being next to the East Coast’s most prominent traffic corridor, most of what they know about the outside world comes from watching TV. If white folks have even heard of Gaston, it’s probably because of Lake Gaston, a dammed-up hydroelectric reservoir well out of town that’s a magnet for well-off retirees. That Gaston doesn’t mix much with this Gaston. Perhaps the best place to begin is in the spring of 1999, when Teach for America founder Wendy Kopp, pregnant with her first child, decided to take time off to visit high-performing TFA teachers, visits she describes in her first book, One Day, All Children…. A priority stop for her was Gaston, where she had heard about the stunning success experienced at Gaston Middle School by TFA teachers Tammi Sutton and Caleb Dolan. Kopp flew into Raleigh, rented a car, drove to Gaston, and discovered a tiny town that, she writes, could serve as a Hollywood set for a “lost in time” movie. At Gaston Middle School, nearly all the students were both black and poor. There, four TFA teachers constituted a third of the faculty members teaching core subjects. And they were having a huge impact. Three years before Kopp arrived, Gaston Middle was one of the lowest-performing schools in the state, with fewer than half the students at grade level. But now, with the jolt felt from the TFA teachers, the school had achieved an “exemplary” ranking in the state’s accountability system — standardized scores, on average, rose by 30 percentage points— and the principal, Lucy Edwards, had been named the county’s principal of the year two years in a row. That evening, Sutton and Dolan drove Kopp through the region to show her where their students lived, some of their houses located down dirt paths. It was an insight into rural poverty. Later, they talked over a chicken tenders dinner at the Texas Steakhouse, at the time the fanciest restaurant in the region. Eventually, Kopp pieced together the strategy behind Sutton’s and Dolan’s success, a strategy that went far beyond academics. “She [Sutton] got to know them through church dinners, cookouts, and family trips where she was invited along. She started a Saturday night basketball league. She and another corps member planned an extracurricular trip to Egypt; even though she and her kids only got as far as Orlando, the trip was a bonding experience,” writes Kopp. The traditional academic day wasn’t enough to catch up her students, Sutton concluded, so she convinced corps members to volunteer their Saturday mornings to host tutoring sessions. Plus, Sutton and other corps members persuaded the principal to lengthen the school day by 45 minutes. Finally, they worked out an arrangement with the principal and families to keep the students in the classroom until 7 p.m. working on homework. In her book, Kopp focuses on Sutton, but her partner in achieving these results was Dolan. Sutton and Dolan are two very different people from very different parts of the country who happened to draw the same TFA assignment. Born in Mount Holly, New Jersey, Sutton grew up in a military family that moved a lot. Her parents divorced when she was in middle school, and for most of her life she was raised by her mother. What she mentions first about her mother is that she grew up in a small town in Michigan and yet still managed to land a National Merit Scholarship award, which she planned to use at Michigan State University. But that lasted only a semester; she dropped out to marry her high school sweetheart and, in Sutton’s words, “begin 20 years of a less than empowering marriage.” That thwarted ambition is something that continues to haunt Sutton, and it affects how she feels about her students in Gaston. No opportunity should be lost. Sutton was living in North Carolina when she graduated from high school, and she could tell the schools there, both high schools and colleges, were deeply segregated. That was very different from living in integrated military communities — “utopian bubbles,” as she puts it. So in choosing colleges she looked for the most diverse ones available, which is why she settled on the University of North Carolina at Greensboro. There, she studied English and political science with the goal of going to law school — but not before signing up with Teach for America, which assigned her to Gaston. Dolan grew up in rural Maine and entered Maine’s Colby College, where he studied creative writing and philosophy. Drawn by the promise of a chance to make “meaningful change,” Dolan signed up for a TFA interview. “TFA had no standards back then,” said Dolan, a master of self-deprecating humor. “I went to the interview in hiking boots and hippie gear and they still took me.” He asked to go to New York City, but instead got assigned to Gaston. Dolan began investing more personal time in his students. Students who failed tests got invited to stay after school for extra tutoring and homework help. Often, that got followed up by some basketball and a ride home, with a stop at Hardee’s for some burgers. Dolan, who today oversees KIPP’s Massachusetts schools, did things in Gaston he’d never advise his teachers to do today in Boston — they’re just not sustainable or advisable at scale. But back then, in tiny Gaston, it was doable, and it worked, with both Dolan and Sutton getting to know their students and their families. “It was crazy and sleepless, but we really spent a lot of time with the kids. It was pretty neat.” That strong school culture they nurtured would form the bedrock for what would become KIPP Gaston. For Sutton, arriving at Gaston Middle appeared to be an awakening. This job, teaching students in a tiny, impoverished town, students who without fierce interventions would have limited college options, quickly became a calling. These students would not miss the chance her mother once had at Michigan State University. Nor would they become indifferent students as she once was in high school and college. Not if Tammi Sutton had anything to say about it. Quickly, Sutton and Dolan became known as the duo who would stop at nothing. In their second year, they decided to take their students on a field trip to the University of North Carolina at Chapel Hill. “We had been hyping this trip,” said Dolan, “telling them this was going to be a really big thing, and they had earned it.” The morning of the trip, the 30 students showed up, but the bus was locked in the bus yard. “Tammi was always very good at convincing me to do ridiculous things, so we cut the bolts on the bus yard and seized the bus.” That created quite a buzz, which only got louder when the students, who loved the trip, talked it up big when they returned. The bottom line to the buzz: There’s something more to this life here at Gaston Middle School than just test scores, something more than just going to class. It was infectious, with other teachers joining in with special events. Groups who did all their homework got to go to the state fair. Sutton and Dolan were creating a reputation. “All of a sudden, kids are doing well on state tests, they’re visiting colleges, they’re talking about different topics. I think that got parents excited. They believed in us,” said Sutton. Those trips, to colleges and elsewhere, helped break down the social isolation they saw in their students. “I remember kids writing that their dream home was a double-wide trailer. That blew my mind. Or they might write that one day they hoped to visit Rocky Mount, which is 30 miles away down 95,” said Sutton. What’s not in Kopp’s book is what happened after that. Kopp knew both KIPP founders, Dave Levin and Mike Feinberg. As part of her book research, she had spent a week in Levin’s classroom in New York City. Not long after her return from Gaston, Kopp recalls standing in her kitchen in New York City having a phone conversation with Feinberg, who was looking to expand KIPP regions. “By the way,” she told him, “I just met two people who need to start a school. These guys are the real deal.” Kopp’s recommendation was all Feinberg needed to know. He called Sutton and Dolan and left a message for them to call back. Feinberg’s call went unanswered for at least three days. Both were too busy teaching and coaching basketball “ All of a sudden, kids are doing well on state tests, they’re visiting colleges, they’re talking about different topics. I think that got parents excited. They believed in us. When they finally connected, Feinberg flew them to Houston and offered an amazing opportunity: KIPP has fresh expansion money, he told them. The network would arrange training as Fisher Fellows, where new school leaders are trained, and then give them each their own new regions — Tammi to Atlanta, Dolan to Denver. Dolan came to the same conclusion. Tempting, but he just couldn’t leave. But instead of turning down Feinberg, they made a counteroffer: We’ll start a new KIPP region, but only if we can do it here in Gaston. What our middle school students desperately need, they told Feinberg, is a challenging and caring high school to attend after they leave here. Feinberg was skeptical. How would you convince great teachers to come to Gaston? Where would you find an effective board to oversee the school? Where would you find a building? Plus, KIPP at the time specialized in middle schools, not high schools. But Sutton and Dolan pushed back: All the reasons you just cited as to why it won’t work in Gaston are exactly the reasons you should do this. Prove you can truly be a national model, even in rural areas. Let this be your first rural site. Feinberg agreed, creating a first-of-its-kind KIPP school. 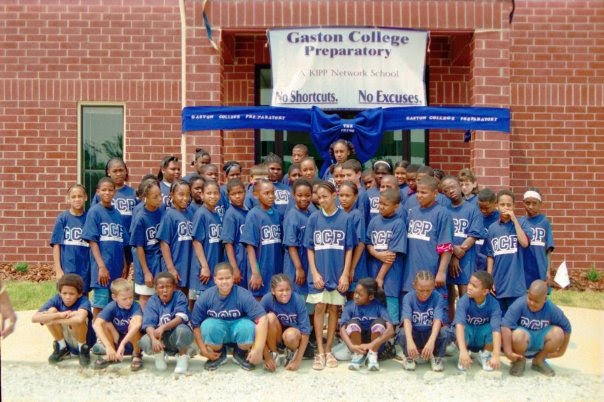 KIPP Gaston College Prep, better known as KIPP GCP, home of The Pride. Sutton chose to keep teaching at Gaston Middle School while Dolan went through a year of leadership training as a Fisher Fellow, a fellowship Sutton would opt for later. Then it was time to recruit students for their new school. The first students were easy to find — the middle schoolers they already taught who came from parents who already knew them. But after that, recruiting became more difficult. Place yourself in the positions of Sutton and Dolan: You’re promoting the KIPP brand, which nobody’s heard of. You haven’t hired any teachers. You’re championing a charter school at a time when nobody in Gaston even knew what that was. And, worst of all, you have no actual school building. Also working in their favor was Southern hospitality. Most families were at least willing to listen. “At some moment in the conversation there was this moment where you could tell they were thinking, ‘Why the hell should I believe you? People like you have not necessarily done well by me in the past.’” But the families, Dolan said, could tell that he and Sutton were true believers in their cause. It came through. Thus, one line often worked: “If you come to Gaston College Prep, you’re going to work hard, you’re going to have a lot of fun, you’re going to graduate from college — and you’re going to help your mother retire.” That last line, Dolan said, always got a laugh. The closing line, though, was usually the clincher: “I’m the principal of the new school, and here’s my phone number.” What local school leader had ever visited their home and offered their personal phone number? KIPP Gaston first opened as a middle school in 2001 with 80 students. Their school site: the 27 acres of former peanut and soybean fields returned to red clay to make room for four modular trailers. Their transportation: three used school buses painted blue. KIPP Pride High opened in 2005, with its founding class, the Pride of 2009. There were 71 students in that very first class. One of their first hires to teach fifth-grade math was Carolyn B. Bell, whose twin daughters, Gara and Cara, had been taught by Sutton and Dolan for two years at Gaston Middle School. Bell, who was then a teacher at a local elementary school, knew she was witnessing something special going on with her daughters. “Wow, they were just excellent teachers. Around here, we don’t have a lot of good teachers, teachers who aren’t there just for the paycheck.” Her daughters were too old to join the new KIPP school, but she wanted to be part of it, so she switched to teach there. In 2009, 48 seniors, The Pride of 2009, walked across the stage to receive diplomas. At the six-year mark, where college success is measured, 61 percent of them had earned college degrees (all but two of them four-year degrees). The most current figure, at the eight-year mark, is 63 percent having earned degrees. That number may not sound extraordinary, but it is. Nationally, only 11 percent of children raised in the lowest-income quartile earn bachelor’s degrees within six years. And that may be understating the gap. The KIPP families in Gaston would fall toward the bottom of that lowest-income quartile, and that class was almost entirely African American, which undoubtedly would push the college graduation odds even longer. Statistically speaking, a class of 48 students means nothing, right? And didn’t the founding class get special attention? Compared with the next graduating class, where the degree-earning rate was a more modest 48 percent, it would appear so. But the Class of 2011 was back up to 61.5 percent at the six-year mark. What about the small numbers? A cautionary note, for sure. But the numbers of KIPP Gaston alumni are growing each year. So far, 568 Pride graduates have become alumni. Each class has seen 100 percent acceptance to four-year universities, and each class has attracted more than $1 million in scholarships. Something compelling is going on in this one-stoplight town. What can possibly explain the recent surge in residents with four-year degrees residing there, other than KIPP Gaston graduates who return and teachers arriving to teach at the growing KIPP network? In Northampton County, home to Gaston, the percentage of residents holding bachelor’s degrees doubled over the past five years, according to Census data. According to state education data, only 20 percent of Northampton County students scored 17 or better on the ACT. Among KIPP Gaston students, 79 percent did as well or better. No sophisticated industries have opened up in the county over the past five years. The paper mills and prisons didn’t create that boost in college degrees. There’s only one remaining source: KIPP Gaston. True, a mere 568 alumni is an iffy indicator. And in the national economic picture, Northampton County is a flyspeck. Perhaps, but the Gaston network is growing. Today, KIPP Gaston has three schools serving 1,244 students. Its KIPP region has six schools serving 1,914 students in Gaston, Halifax, and Durham. Still small, but when viewed in a far larger context of KIPP nationally and the other big successful charter networks, a pattern emerges — a pattern that says something about the beginnings of a breakthrough. Disclosures: The Walton Family Foundation funded a writing fellowship that helped produce The B.A. Breakthrough and provides financial support to The 74. The 74’s CEO, Stephen Cockrell, served as director of external support for the KIPP Foundation from 2015 to 2019. He played no part in the reporting or editing of this story.